Home Premiere VIDEO: ACTRESS ENIOLA BADMUS GIVES US ‘GHETTO BRED’, ANOTHER NOLLYWOOD ROM-COM! 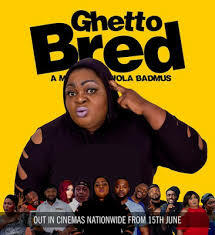 VIDEO: ACTRESS ENIOLA BADMUS GIVES US ‘GHETTO BRED’, ANOTHER NOLLYWOOD ROM-COM! Enola Badmus has Funke Akindele-Bello to thank for her career. Or at least for her star-making appearance in the pop culture phenom, Jenifa. As Gbogbo Big Girl, the plus-sized pimp preying on greedy University girls, Badmus made quite the impression. Even though she left the Jenifa franchise in its early days, the appeal of the character took longer to fade. Badmus to her credit has been able to seize the opportunities provided by this breakthrough. She has been able to weaponize herself as a double threat; as a comedian able to work effectively on stage and on screen, in mainstream fare and in the Yoruba side of town. Her work isn’t exactly marked by excellence, but it is the kind of low brow humour that easily attracts a suitable following especially among working-class groups. Her range is limited, with many a gag circling around her body size and rough edges. Like Akindele-Bello, Badmus has learnt to take matters into her own hands when it comes to creating opportunities for herself on film. There are after all, only so many times one can play the domineering wife bullying irresponsible husbands into submission. Last year in the little-seen – and rightfully so- Basirat in London, she tackled immigration games and catfish scams involving characters from both sides of the divide. The irony is while this scenario was played for laughs, there was almost none to be found in the sad excuse for a film. Think Osuofia in London and its many descendants. For her latest, Ghetto Bred, Badmus returns to her stomping grounds to mine material that she is familiar with. Written by and directed by Kingsley Iweru, Ghetto Bred does not pretend to aspire to anything grand. Badmus wants to make a film and she wants to hack it so as to get maximum returns from meagre investments. Every frame of Ghetto Breed speaks to this; from the dull camera work to the drab surroundings that serve as the setting. To help her cause, Badmus rallies on goodwill from some of her comic colleagues. Yaw, Helen Paul and Ushbebe respond with cartoonish performances but don’t expect Ghetto Bred to burst out the jokes a mile a minute. Experience with films like Head Gone and 200 Million will teach you to manage expectations. Crackling stage presences don’t always translate to film and where Yaw and Ushbebe try to conjure up funny from a not so pleasant situation, Helen Paul as Debby, a clownish best friend, does not help out in any way. Badmus casts herself as Efe, a Lagos taxi driver with a motor mouth and a penchant for causing trouble wherever she goes. At home where she lives with her brother Ovie (Yaw) and at her workplace, the taxi park in Yaba headed by Chairman (Jide Kosoko,) Efe is a menace with a talent for getting on everyone’s last nerve. Angry and frustrated, she picks fights at home with the neighbours and at work with her colleagues and clients. Because Badmus is the producer, Ghetto Bred demands that you stay on her side despite her deplorable behaviour. Much of the movie, especially the first half, is Badmus verbally and physically sparring with anyone that so much as crosses her path. No one is spared and while Efe’s tirades aren’t exactly funny- they are grating and unchecked most of the time- Badmus will manage to land one joke just as you have resolved to give up on the entire shebang. Ghetto Bred makes a sharp detour into romantic comedy territory in its second half and all of a sudden, Efe is the damsel in demand, boxed into a situation of choosing between two suitors, the oily Onos (Ushbebe) and dashing Fred (Bolanle Ninolowo) with a bland personality. Actually, this plot twist becomes Ghetto Bred’s biggest win. Badmus’ insistence on playing the desirable leading lady is a welcome middle finger to all of the filmmakers who would rather typecast her as the bully. She has a lot of fun in this role and even if the romantic subplot is handled as predictably as one would expect from a film like this- one of the guys cheats- it is still pretty fun to watch. Ghetto Breed isn’t suited for the big screen at all but Efe seems like the kind of oafish character who will find success on the small screen, breaking hearts and bones with equal aplomb. The seeds have been planted, the market is there. Badmus only needs to find a resourceful team to help package and promote her stuff.